Learn all about the layers of the ocean in this visual experiment! Scientists have only explored less than 5% of the ocean, so it is still a bit of a mystery. One thing we do know is the different layers of the ocean and this experiment turns them into a density column so you can clearly see each layer. So as well as learning about the ocean, you can learn a little about density at the same time! Fill 1/3rd of the bottle with black treacle. 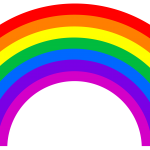 This represents the Midnight Zone, which is the deepest layer of the ocean. Down here there is no sunlight and some weird and wonderful creatures that have adapted to living in complete darkness! 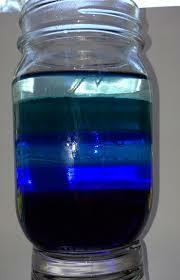 Mix some water with blue food colouring until it is a dark blue colour. Pour it carefully down the side of the bottle so it sits on top of the treacle, until you have filled another 1/3rd of the bottle. This represents the Twilight Zone, there is very little sunlight here, it looks completely dark to our eyes! Finally, mix a little bit of blue food colouring with some oil, until it is a light blue. Pour it carefully down the side of the bottle, so it sits on top of the water, until the bottle is full. Let the levels settle and then write a label for each zone and stick it on the bottle. The reason that the 3 layers haven’t mixed is all to do with density. Density is how much mass is packed into one space. Treacle is denser than water and oil, so it has more mass and so sits at the bottom of the bottle. Oil is the least dense and so sits on the top! Researching the different living creatures in each layer and adding some pictures to your bottle! Exploring density further with our density column experiment.